This is a progress report on the construction of the apparatus for the Fiber-Optic Michelson-Morley Experiment (FOMMX). The first phase is mechanical, to be followed by electrical, data-taking computer, software, communications, laser/optical fiber phases. This strictly mechanical phase is perhaps 80% complete. The completed assemblies are shown in the photograph and described below. The main assembly that is not yet done is the motor support frame. Provide mechanical support for two 5 meter lengths of optical fiber. Each length is called an arm. The two arms are to be set perpendicular to each other in a horizontal plane. The arms must rotate in a horizontal plane. The arms must be positioned near the ceiling, rotating, while taking data. They must be positioned at or a few feet above the floor for initial construction and later maintenance. The hub has both arms in place. It is temporarily hanging from the top of the stator. 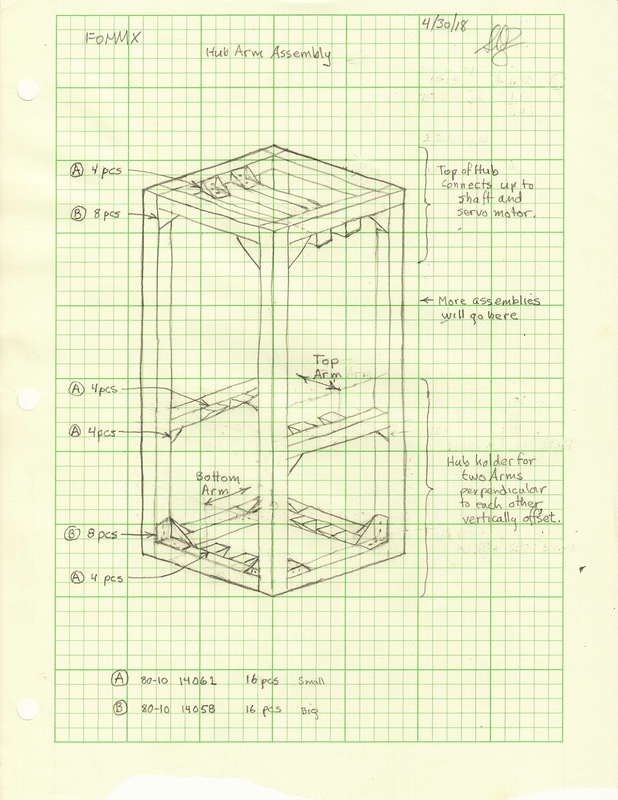 The optical fibers of the arms will be immediately contained in clear plastic trays about an inch wide. The trays will be slid into the clear 4" diameter clear acrylic tubes. Clear tubes are used to enable anyone to see the optical fiber without dismantling the arms. 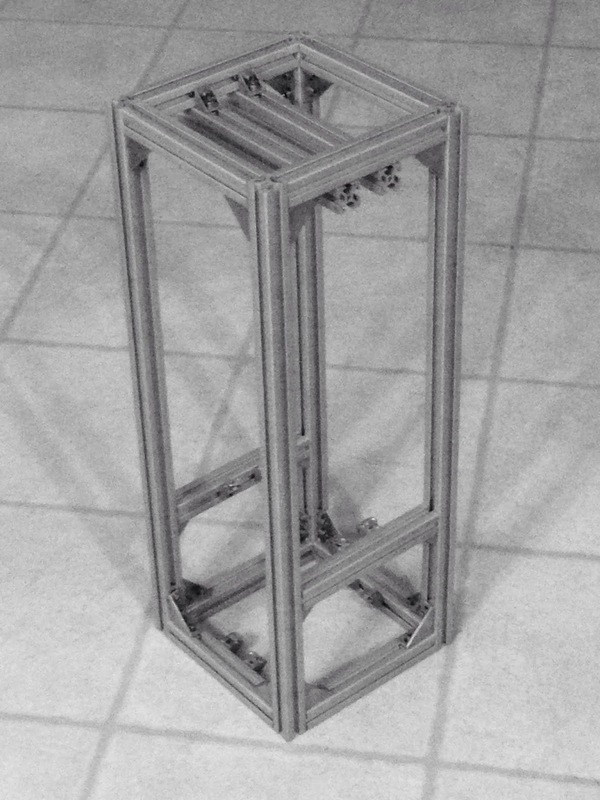 Each acrylic tube is supported by an aluminum frame made of four 1" x 2" x 6' extrusions manufactured by 8020.net. These acrylic tubes are attached to the aluminum frames by cords. 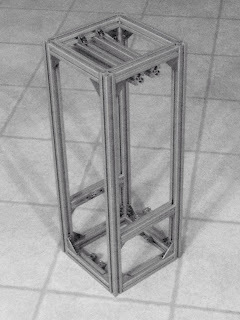 The two arm frames are attached to the hub, which is 9" square and 30" high and made from 1" x 1" extrusions. The hub holds the arms perpendicular to each other. Not yet completed is a servo motor assembly that will fit above the hub and that will cause the hub and arms to rotate at more or less 4 RPM in a horizontal plane. The height of the assembly will be set near the floor or near the ceiling by an electric hoist mounted in the ceiling. The hoist is out of the picture but two lines hoist are visible in the picture above two pulleys in the top of the assembly. The 1/8" steel cable leaves the hoist, goes down to the pulley unit, across the pulley unit, then up to an "anchor" in the ceiling. The pulley unit is the top of the stator. The top of the stator will connect to the motor unit when the latter is complete and the motor will connect via a shaft to the hub. The Hub Assembly is Built. Here is the drawing that I prepared for this assembly and the physical result. The beams are aluminum extrusions from 8020.net . The beams have "T"-slots on each face to enable the beams to be connected to each other or to something else. The corner connectors and hardware are also from 8020. The weight is 9.4 pounds. The Fiber Optic Michelson-Morley sensor is two “arms”, or straight lengths, of optical fiber. These will each be 14' long and set perpendicular to one another in a horizontal plane. These arms will rotate as a unit in the horizontal plane when operating. 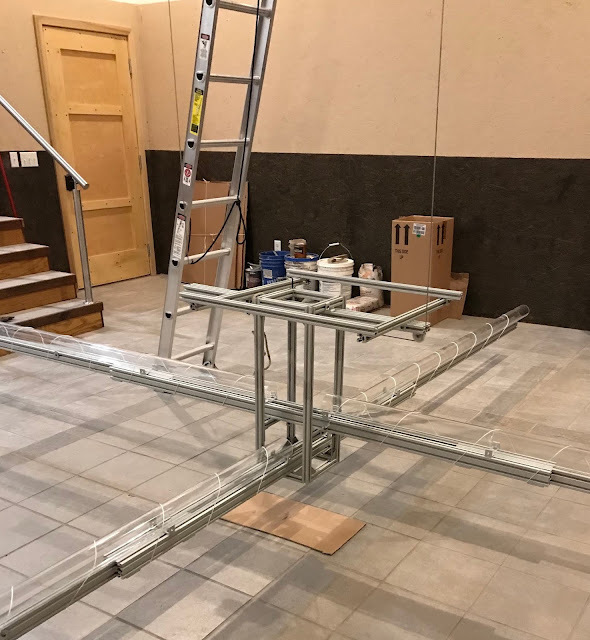 The purpose of the hoist is to lower the interferometer for maintenance (and initially, construction) at floor level and raise it to the ceiling for collecting data. This has the side-benefit of clearing the the floor area for general use while collecting data, which will be almost all of the time. Installing the hoist in the lab. The hoist installed and ready for action. This marks the beginning of construction of the FOMMX apparatus. The apparatus of a Michelson-Morley experiment measures the instantaneous difference in the speed of light in two perpendicular directions and repeats this measurement over a variety of orientations. These results are combined to show the velocity of a presumed ether through the solar system. The general approach is to direct light along two perpendicular arms and interferometrically measure the difference in speeds between the light-paths in the arms. The arms are horizontal and rotate about a vertical axis a few times a minute. The horizontal plane of rotation sweeps through a large portion of the sky each day. These rotations provide the variety of orientations needed for calculations. The sense element of the arms is an optical fiber which lies in a tray, which in turn lies in a clear acrylic tube 3 inches diameter. The straight length, end to end, of the fiber is about 16 feet, a bit longer than the straight light path of Dayton Miller's apparatus. One arm includes two 8 foot lengths of tube joined to the hub. The sixteen foot arm's tubes are supported by beams that are aluminum extrusions. The rotation of the arms is driven by a servo-motor attached to the ceiling of the lab. The motor-shaft is connected to the hub. The hub holds a number of components in addition to the two 16 foot arms. This includes a DFB diode laser, two photodetectors, a data logging computer, and fiber optic components. The components that produce heat are placed above fiber components to avoid potential thermal variations in the fiber that might affect the interferometric signal. 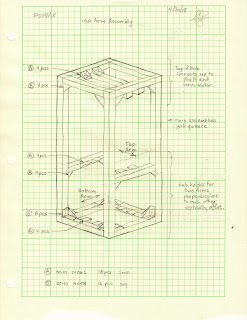 I have just completed a detailed design of the apparatus, not yet fully documented. This was a grueling quick-study of diode lasers and optical fiber as applied to commercial products for laboratories. The analysis includes detailed component costs to set up the apparatus and begin collecting data and is estimated at $7,317.15. Plus or minus. Probably plus. Update 8/15/18: The estimate is now about $8,500.